It is essential for mixed martial artists (MMA) practitioners to know the different characteristics associated with MMA gloves as they look for their first pair. MMA gloves are not intended for going all out on the heavy bag or your training partner during sparring sessions. Regular boxing gloves are best for these activities, since the MMA gloves do not have the same amount of wrist support and padding. However, the MMA gloves are great for light and technical MMA sparring sessions. These gloves have individualized finger compartments that permit its user to not just strike, but grapple as well. The following are the 7 best mma gloves for beginners listed in no particular order. 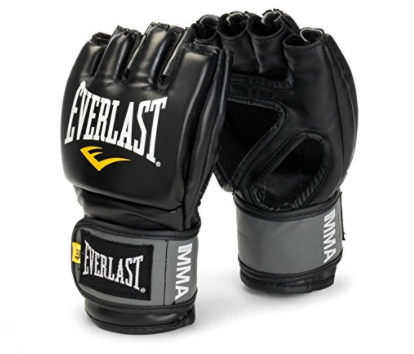 Everlast is a well-known boxing brand that has expanded their product lineup to sell MMA gear. Their pair of 4 oz. 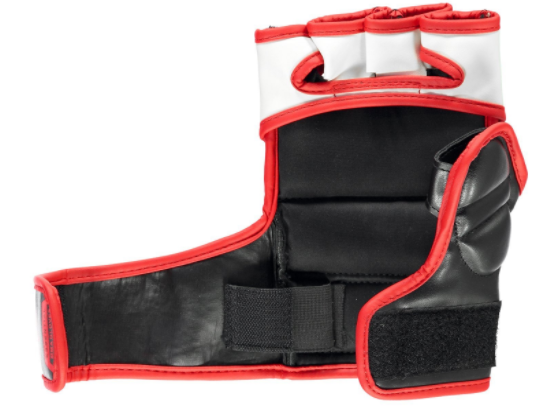 MMA gloves is constructed with synthetic leather and are only available in red and black. The inner lining is designed with Everlast EverDri technology to have moisture wicking capabilities. The open palm feature greatly complements the inner lining for increased breathability. Due to the inner lining sweat absorption ability, these Everlast MMA gloves need to be aired out after training so that the gloves do not build up odor over time. This particular Everlast gloves has an open thumb style design. The preference for this feature varies between individuals. Even though this open thumb design lacks protection from impact on the thumb, it allows its user to move the thumb more freely and is great for grappling scenarios. The Everlast gloves has standard Velcro straps for keeping them secure to an individual’s wrist. Unlike the other MMA gloves below, Everlast did not create their gloves to have padding on the back of the hand. Therefore, these gloves are not as protective. However, the Everlast gloves are a good choice for individuals not wanting to break the bank as they get their feet wet in the combat sport of MMA. Twins is known to produce high quality products from Thailand. 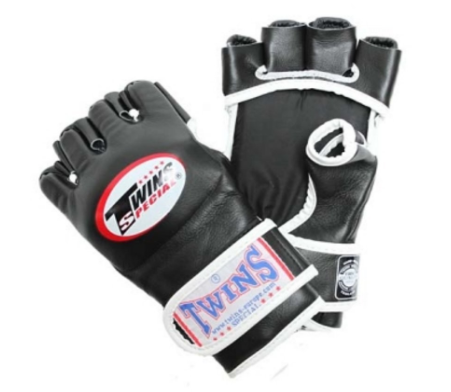 This offering from Twins is a pair of competition style MMA gloves that are handmade from Thailand with a tough leather exterior and a soft fabric interior. A unique component of the Twins gloves is how the fingers are not attached adjacent to each other and have thin leather strips run between them. These features increase the maneuverability for the fingers and makes the Twins glove suitable for grappling situations. The Twins glove has a thumb sleeve for additional grip onto the MMA glove. However, it has no padding for thumb protection. In the image above, you can see that the thumb sleeve is reinforced with white leather. This component softens and keeps the black leather material from scraping your thumb. It is a shame that this white leather component is not implemented on the finger portion of the gloves as well. The Twins Special gloves high density padding is better at protecting your knuckles than your training partner, since it is not forgiving if you land a clean shot. Therefore, you should be careful when sparring with these gloves. Fairtex Ultimate MMA gloves is another pair of handmade gloves from Thailand. It is available in a wide array of colors. In addition to its leather construction, Fairtex’s inner lining consists of a water-repellant nylon. This Fairtex glove has a sturdy construction that needs to be broken in a bit before it becomes comfortable to use and a snug fit can be obtain. It has a large open palm design for maximum ventilation. The glove’s finger sections are split in a manner that allows for more control, which complements well with the glove’s open thumb style. Some individuals may not like the leather strip that runs between the palm and thumb section. This leather strip might feel fragile and there is long term durability concerns about it. Fairtex designed its Ultimate MMA gloves with 3 layers of padding to protect the user’s hands. Despite the multiple layer of padding, these are fight gloves so its high density padding could be rough on your training partner. Fairtex Ultimate MMA gloves may be one of the most expensive option on this list, but it is well worth it. These gloves are competition ready and suitable for all expertise levels. The Tokushu is a pair of 4 oz. 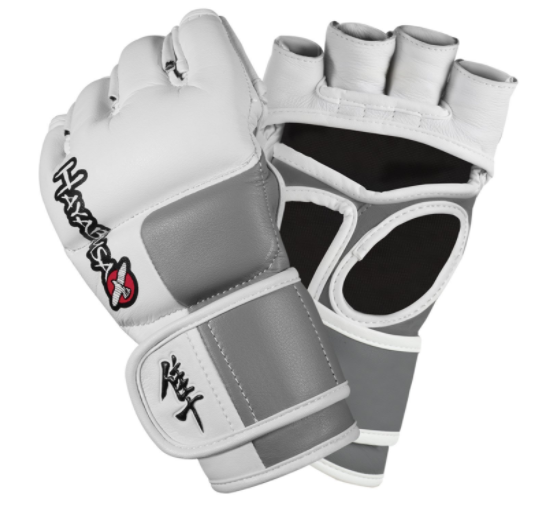 MMA gloves from Hayabusa that has a clean and appealing appearance. Its open thumb and palm design enhances the ventilation factor. This element will be highly regarded during long training sessions. The edges of the thumb and palm lining is reinforced, which soften the edges and improves the Tokushu overall comfort level. 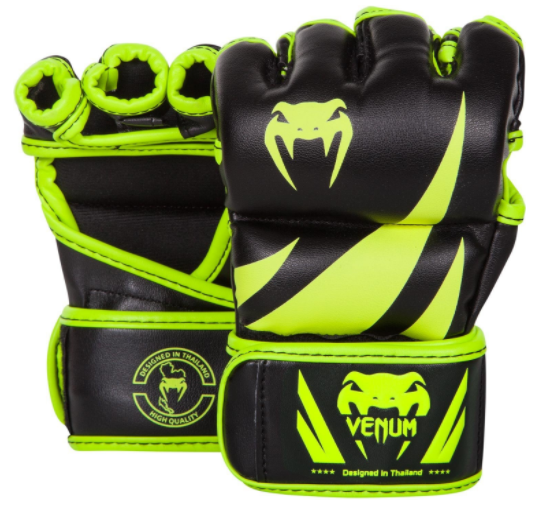 Furthermore, the combination of the latter with the glove’s soft bamboo lining makes it one of the most comfortable MMA gloves available on the market. The Tokushu bamboo lining has moisture wicking capability and antimicrobial properties to keep your hands dry and prevent odor build up. Their exterior material is composed from “Vylar engineered leather,” which is Hayabusa’s own synthetic leather construction that is designed to be resistance against cracking. One of the best feature of the Tokushu gloves is their Dual-X wrist closure system that consists of dual wrist straps that allows individuals to obtain a secure fit and it also acts as extra wrist support. As a result, these features help reduce the chance of wrist injury and allow you to punch harder with less concern about hurting yourself. The Hayabusa gloves have terrific padding for the knuckles and the back of the hand. Hayabusa is consistently producing exceptional training gears and the Tokushu is a top notch choice for any beginners. The Venum Challenger is a great starter choice sold at a reasonable price. They have one of the most eye catching design, especially if you choose their bright neo yellow or orange color option. This is the first MMA glove on this list that has a thumb attachment with a sizable padding to go with it. Besides the thumb padding component, one of the best thing about this glove is its wrist strap. The Challenger’s wrist strap is long, wide and is able to wraparound twice for extra tightening and acts as superior wrist support as well. The padding running across the knuckles consists of layered foam for additional protection. This 4 oz. glove has padding on the back of the hand that is not has thick, but still does its job well. The Challenger’s exterior is composed of synthetic leather while its interior is a moisture wicking fabric. In addition to the open palm and inner lining, Venum has also designed the Challenger to have air holes on the underside of the finger area for extra ventilation. The comfortability factor of the Challenger is enhanced due to the reinforced edges at the thumb, palm and finger slots. All in all, the Venum Challenger is one of the more protective choice that should be recommended to new MMA practitioners. 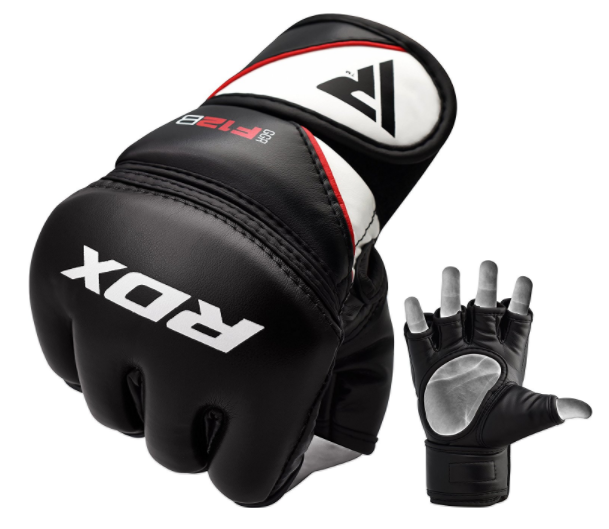 RDX has a large lineup of MMA gloves. Quest is one of their model that is specifically created with the needs of a grappler in mind. Despite only being available in one color option, it has a very nice and sleek look. The Quest’s cowhide leather provides a sturdy and super durable exterior. The glove’s thick multi-layer padding is integrated with gel technology for its shock absorption properties. There is also a thin padding on the underside of the palm, which is great for cushioning your palm when parrying a punch. 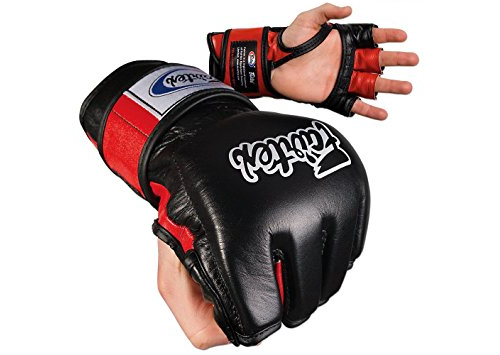 Another feature of this MMA gloves that makes it stand out is its extended finger padding for additional knuckle coverage and the large air holes on the underside of the fingers. The blend of these finger air holes with the RDX open palm design makes the Quest gloves highly breathable as the inner lining fabric draws moisture away from the user’s hand. The reinforced edges for everything is a nice touch as well. The Quest gloves have a thumb sleeve composed of a fabric material instead of leather, this allows for the individual to flex their thumb easier. However, there is no padding to accompany it. RDX has made this Quest glove comfortable and easy to form a fist. 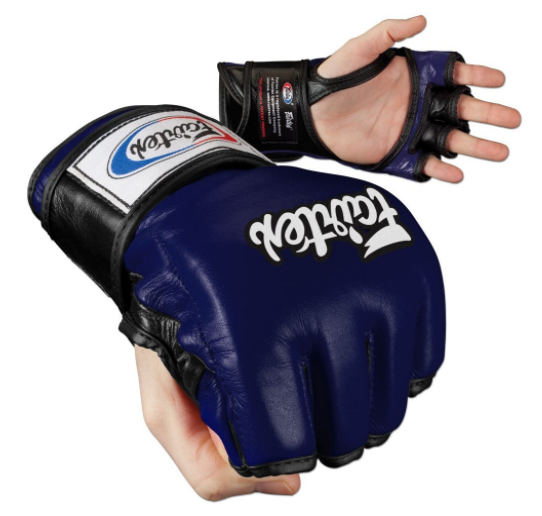 Therefore, MMA practitioners relying more on their grappling skills should consider the RDX Quest gloves. The 4 oz. MMA gloves from Sanabul is a well-padded selection that has padding on the back of the hand and thumb to go with its knuckle padding. Unlike the Venum Challenger gloves above, the Sanabul thumb padding is separated into three sections. This design allows for a protective barrier without interfering too much with the thumb’s flexibility and range of motion as you try to grapple. One negative characteristic of the Sanabul glove is that it uses a wide leather strap instead of a thumb sleeve. The thumb strap edges are not reinforced and can be annoying as it digs into your skin whenever you form a fist. The Sanabul gloves is well ventilated due to its open palm and inner fabric lining. The Sanabul has an interesting Velcro closure system that gets a mixed bag of reaction on whether an individual will favor it over the type of wrist straps that can circle around the individual’s wrist twice. The Sanabul wrist straps do not act as great wrist support by itself. 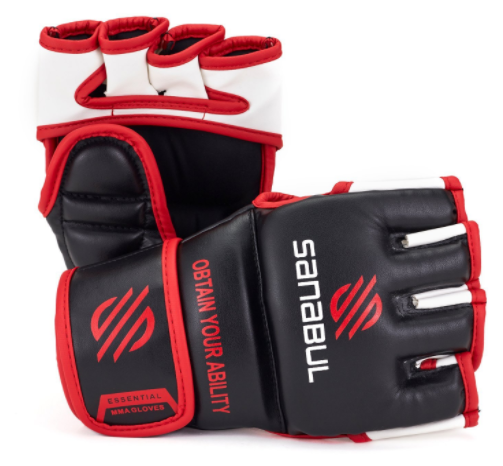 The Sanabul Essential MMA gloves are recommended to new MMA practitioners who prefer purchasing an affordable pair of gloves, at first, as they determine whether they are ready to commit to training MMA for the long term.